The Cybex Cloud Q infant car seat is the first on the market to have a recline flat feature so your baby can nap more comfortably outside of the car. There's a lot more to love about this car seat than just the recline, though! It also has a load leg on the car seat base, a unique side impact protection system, and a super cushy seat with inserts for newborns and smaller infants. Let's begin with a review of the Cybex Cloud Q car seat features. The lay flat recline feature is unique among infant car seats. When the car seat is off the base, you pull a lever on the back of the seat, behind baby's head, and slide the back down and forward. Babies aren't supposed to stay in a car seat for more than a few hours at a time because the angle isn't good for them. Newborns and smaller infants are at particular risk of airway compromise when sitting at the angle required by infant seats. An infant car seat is the safest possible way for a baby to ride in the car, but not ideal for long periods of time. The recline of this Cybex car seat addresses these issues in a unique way. When reclined, the car seat acts like a stroller bassinet or an old-fashioned carry bassinet. While babies can usually get comfy no matter where they are and what position they're in, it's probably more comfortable overall to sleep while laying down. The load leg on the car seat base is also fairly rare. There are only two other infant car seats in the U.S. with a load leg—the Aton Q, which is another Cybex car seat, and the Nuna Pipa. The load leg extends down from the base underneath the baby's back. In a crash, the leg keeps the car seat from rotating downward, which also then reduces the amount of rebound or upward motion. Less motion in a crash generally means less chance of injury for baby. The load leg is easy to use. Just flip it out before installing the car seat base. Then you need to squeeze the lever on the side of the leg to adjust the height according to the instruction manual. It needs to be pressed against the floor of the car, but not enough to move the base upward. It just touches the floor to add support. You need to be sure the vehicle floor below the load leg is flat. The third exciting new feature is the linear side impact protection system (LSP). A telescoping piece on either side of the car seat pulls out when the seat is installed in an outboard position (next to the vehicle door). The LSP piece locks into place close to, but not touching, the door or side panel of the car. If a side impact crash happens, the LSP takes the first impact and transfers the force throughout the car seat shell. The LSP system works along with the foam car seat liner and head wings to provide side impact protection. It's the only rigid side-impact protection system available in the U.S. right now. Installing the base is incredibly easy. If you're using LATCH, lift up the belt tensioning plate to access the LATCH belt. Click the connectors into the lower anchors of your vehicle, pull the webbing tail to remove slack, and close the tensioning plate. There's a big orange lock mechanism in the center with pictures to tell you when it's closed properly. The angle indicator is near the hinge of the tensioning plate. There are two correct angle positions, one for babies between 4 and 22 pounds, and one for babies 22 to 35 pounds. The angle indicator is easy to read—just check the position of the little ball inside. If you need to change the recline angle, there's a leveling foot on the base. There are four recline positions to work in just about any car. For installation with a lap and shoulder belt, open the belt tensioning plate and route the vehicle seat belt through the belt paths on the base, according to the instructions. Remove the slack from the seatbelt, and close the tensioning plate. You can also easily install the car seat without the base using a seat belt. You can use a European belt route option where the shoulder belt goes behind the car seat shell and the lap portion of the seat belt goes across baby's legs. That installation adds stability and reduces motion in a crash. If the European belt route doesn't work in your vehicle, you can install with a typical belt route. Either of the belt routes requires careful attention to the instructions, though. The carrier handle has to be in the "drive" position, which is down by baby's feet. That's true for any type of installation with this car seat, but when you install without the base, the seat belt is actually routed through belt paths on the handle in addition to belt paths on the seat. The car seat itself is easy when it comes to securing your baby in the harness. The no rethread harness system is adjusted via a lever at the top of the head wing section. Choose a harness height that is at or below baby's shoulders, buckle the baby up, and tighten the harness via the webbing tail by baby's feet. To loosen the harness, press the lever above the webbing tail, and pull on the harness straps. The newborn padding included with the Cloud Q fills some of the space in the bottom of the car seat so that smaller babies are at a better angle in the seat. The padding also lifts the baby up a bit to make sure the lowest harness position is below baby's shoulders. The instructions recommend using the insert until the baby weighs about 11 pounds, or for about 3 months. Average to large babies will fit well in the Cloud Q. At the lower end of the weight range, the fit may not be as good. It often depends on the baby's height and shape, but a 4-pound baby, even with the infant padding, is likely not big enough for the lowest harness slots to be below the shoulders. The car seat should be useful for about 2 years, but this also depends on your baby's height and weight. The Cloud Q car seat can be used with many Cybex strollers as a travel system. It can also be used with many other stroller brands, including UPPAbaby, Bugaboo, Maxi Cosi, Baby Jogger, and Nuna. The Cloud Q fits on Maxi Cosi car seat adapters, so most stroller models with Maxi Cosi adapters can be used with this car seat. Most sleep safety experts and infant health groups say babies shouldn't nap in their car seats outside the car and should spend as little time in the car seat as possible. While it would be better for baby to be reclined in a car seat versus sitting more upright, it's still not ideal to leave the baby in the seat for hours. The Cloud Q recline might encourage some parents to let baby lounge longer when a nap in the crib or a baby carrier might be a better option. The reclined seat may be more comfortable for a baby versus a typical infant car seat used with a travel system stroller, though. It's also a very expensive car seat. If it fills a need for your family, and it's the car seat you'll use correctly every time, the price may be worth it for you. Many families are not willing or able to invest over $400 for an infant car seat, though. If you add in the Cybex Priam stroller or a high-end stroller from another brand, your travel system will cost close to $1500. The lowest harness slots aren't low enough for most preemies or smaller newborns. A 7-pound baby is fine, but those 4- and 5-pound babies may not fit properly at first. This car seat has some pretty specific instructions that are not intuitive. While everyone should be reading their car seat instructions, many do not. The seat belt routing without the base and the handle position during travel are unusual, and won't be done properly if the instructions aren't read. The lay-flat position cannot be used in the car, and there are little red tabs that extend out over the belt path when it's reclined. The car seat won't fit onto the base that way, either. However, the red tabs don't lock into place, so someone could push them out of the way and install the car seat without the base. Again, everyone should be reading the directions, but many do not. That could put a baby in danger. The load leg may not work in your vehicle if you need to install the car seat in the center position. Many middle seat positions have a raised hump in the floor where the load leg can't be used there. It's safe to install the car seat in an outboard position, especially when you use the LSP system for extra protection, but some families may be puzzling several car seats together in the back seat, so an outboard position may not be available. The Cloud Q is readily available online, but not so much in stores. Many families will need to order online. If you have to order one, make sure you order from a store with a good return policy. That way you aren't stuck with a car seat that doesn't work well in your vehicle. 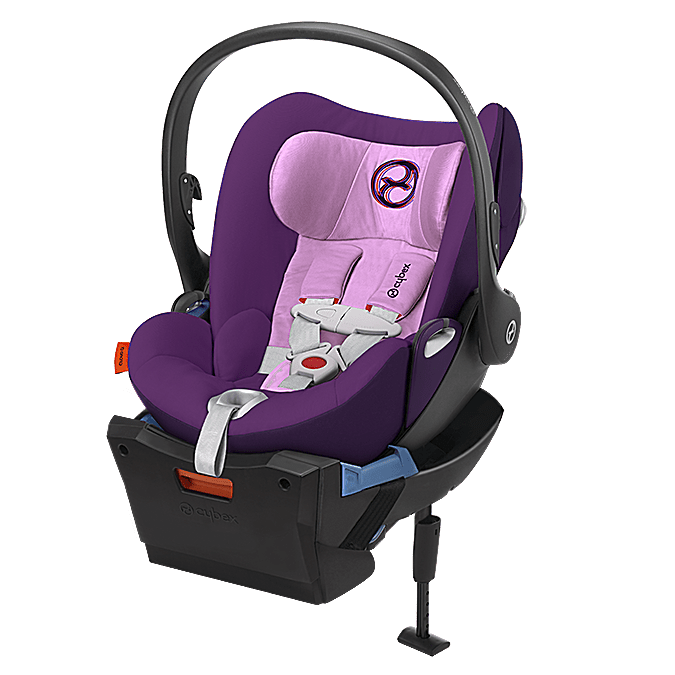 The Cybex Cloud Q is a great car seat with lots of unique features. It will do well for many families as long as they're willing to read the instructions carefully, and the LSP system is an excellent idea for additional protection against injuries in side-impact crashes. The load leg, too, offers extra support that translates into less chance of injury in a crash. Installation is extremely easy in most vehicles, whether you use a seat belt or LATCH, base or no base. The reclined seat position is unique, and probably more comfortable for baby than sitting upright if you're using the car seat atop a stroller. However, parents must remember that a baby cannot be left unattended in the car seat, and time in the seat should be limited, whether it's reclined or not.